Once upon a time, the Southern husband and I went on the Atkins diet, which banishes all the fun carbs from your life. No bread. No pasta. All the bacon you can eat (which is what lured me in, because UNLIMITED BACON) but after being on it for about a half hour, I developed an overwhelming nostalgic yearning for anything the included the word carbohydrate. But my mama didn’t raise any quitters, so I hung on for the month or so it took to lose what I wanted to lose, and part of what got me through was this whipped cauliflower. Which I am here to tell you…brace yourself…is just as good as mashed potatoes. I promise. And part of my proof positive is that the notoriously picky, mashed potato-loving Southern daughter asks me to make them on a regular basis. Because they are just as good as mashed potatoes. And by the way, a little easier to make, what with no peeling and all the mashing being done in the food processor. I know, it’s like the Twilight Zone today on the blog. So, cut up a head of cauliflower into pieces (2-3 inch pieces are just fine) and steam it up until it is nice and tender, about 10-12 minutes. Drop it into the food processor with a little butter, a little cream cheese and a little salt, and let the processor rip. You want nice smoothness, with no chunks. I usually let it go for a full minute. And…that’s it! Taste it and add a little more salt if you think it needs it. And if you want to melt a little more butter on top, I won’t tell, although I am perfectly happy just grinding some black pepper on top and calling it a day. Did I mention that whipped cauliflower is just as good as mashed potatoes? 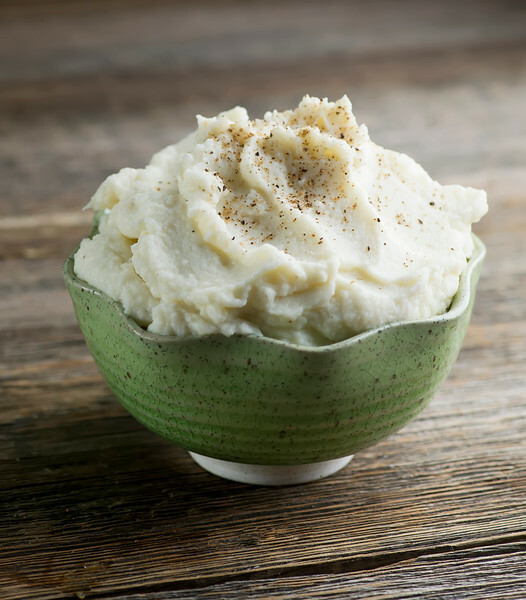 Once you try this easy recipe for whipped cauliflower you might just forget all about mashed potatoes…it’s that good! Steam cauliflower until tender, about 10-12 minutes. A paring knife should slip into the cauliflower easily. Put cauliflower into food processor with butter, cream cheese and salt. Process until completely smooth, about 1 minute. Taste and add salt if needed. Place in serving dish, grind fresh pepper on top and serve. For some insane reason, our kids don’t get excited about mashed potatoes. But they will tear up mashed cauliflower like it’s their job. Go figure. I generally do half and half these days…equal amounts of each. Makes the cauliflower go further and with a family of five, every little thing helps. Delicious. I could never SERIOUSLY low carb it, but I can moderate carb it with the best of them! And such a diet definitely involves this whipped cauliflower! Ha! Moderate carb it – that’s pretty much me too. I added some garlic salt and it tastes sooooo good! GREAT idea on the garlic salt – I have to try that next time! Hi Ann! You can still steam the packaged pieces – you will just need a little less time for steaming – probably 10 minutes or so.